Juvenile idiopathic arthritis (JIA) is an umbrella term for a group of persistent arthritides of unknown etiology that affect children under the age of 16, and last for more than 6 weeks (Petty et al. 2004). The clinically defined categories are shown in Table 4.1. The pathogenesis of these diseases involves both autoimmune and genetic factors. Dysregulation of the immune and inflammatory systems are observed. In addition, hormonal, infectious, and other environmental agents yet to be identified probably participate in the disease-diagnosing process. The diagnosis of JIA is rendered from the combination of data derived from the history, physical examination, and laboratory testing. The prevalence of JIA varies depending on subtypes. As a group, the prevalence is generally agreed to be 1:1,000 children. 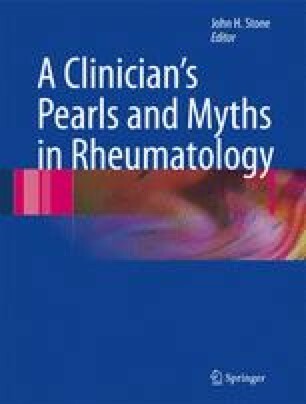 For the vast majority of patients with JIA, the immuno-genetic associations, clinical course and functional outcome are quite different from adult-onset rheumatoid arthritis. In addition, certain specific disease subsets are not observed at all or are seen very rarely in adults. These subsets include the oligoarticular pattern of arthritis associated with uveitis and antinuclear antibodies, and sJIA (sJIA). Most patients with JIA do not achieve a remission and require long-term treatment. However, the use of new therapies such as methotrexate and the biologic agents has improved the outcome of JIA.